The main objective within the scope of this project was to establish a “single point of truth,” which gives the entire worldwide group access to current documentation of all business and IT processes and their changes. 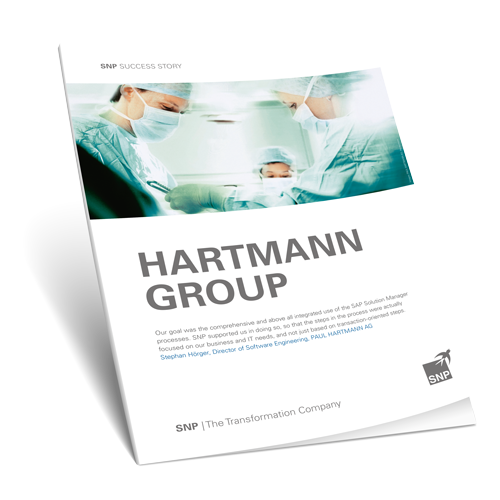 Within the scope of the process of evaluating different products, the HARTMANN GROUP decided to establish the SAP Solution Manager as the central ERP system and solution for their IT. The SAP Solution Manager is a central point of access to all of the HART MANN GROUP’s current documentation of business and IT processes. In addition to a standardized view of all business processes, the structure allows the individual companies to view the information in a clearly arranged manner. Centralized reporting and coordinated KPIs play a key role in managing the IT organization. The centralized incident and change request management makes the management of the IT team transparent and also increases system stability. With the help of the SAP Solution Manager, the company was able to reduce in-house developments in the ERP system by 18 percent without impacting existing processes.